The rise of iPaaS has also led to the rise of citizen integrators—business stakeholders empowered to build their own integrations outside the realm of IT. Unfortunately, organizations are learning the hard way that this self-service approach to integration obscures the big picture. Rather than treating integration as one component of an enterprise-wide strategy aimed at turning data into currency, this approach treats integration as an end unto itself. In this webinar, join us for a discussion of dPaaS, an emerging approach to integration and data management that brings the whole picture into view and puts your organization's focus squarely where it belongs: on uncovering actionable insights from your data. As governments drive the adoption of e-invoicing through initiatives such as EU's PEPPOL and the US's recent requirement that all agencies support e-invoicing by 2018, businesses around the globe are gearing up to meet them halfway. But just as the EU is driving standardization of e-procurement and e-invoicing within Europe, its member countries are collectively hampering it as a result of complicated local regulations that often accompany cross-border e-invoicing. In today's fast-changing data climate, reliance on IT is growing. But for many businesses, so too is the scarcity of resources needed to support their increasingly complex IT environments. The result is that every chosen IT endeavor comes at the cost of another. One endeavor with a particularly steep tradeoff is integration. The data transfer and transformation processes that are the foundation of integration require considerable IT overhead to develop and maintain. And while these operations are critical to your organization's well being, they provide no strategic business value in and of themselves. Data everywhere but nothing to analyze. How many initiatives at your organization start or end with this irony? Myriads of new data sources have the potential to make the data you already have more valuable, while competitive and regulatory pressures are making it more precious. But chances are, you’re just beginning to realize that you’re in the dark when it comes to tracking, governing, securing, and, ultimately, deriving insights from your organization’s data. Now that IBM has discontinued support for many versions of Sterling Gentran®, users are faced with some big questions. What will replace my legacy Gentran environment? How painful will the transition be? Don't look now, but your legacy integration technologies have turned on you. Big data, the cloud, and the Internet of Things are disrupting the integration space in ways never seen before and legacy integration technologies such as Enterprise Service Bus (ESB) have become the Achilles' heel of many organizations. In this webinar, Liaison VP of Emerging Technologies Robert Fox exposes the crippling weaknesses of legacy integration technologies—and highlights how the next generation of integration technologies is addressing these weaknesses to ensure your integration operations don't turn from friend to foe. In today’s competitive and fast-moving business world, most organizations need to quickly adapt to new markets and opportunities, and need to get the most out of precious business assets like data. Data governance (DG) becomes an important approach to optimizing business processes and the data that flows through them, by eliminating redundancies and creating accountability within workflows. Data governance comprises the use of redefined organizational principles, changes to logical decision-making, collaborative interactions across the organization, and, very importantly and typically overlooked, cultural maturity. Please join Tom Marine, who has compiled some key steps to help you create and maintain a DG initiative in the DM World. Are you spending more time on your integration operation challenges instead of what is really important to your business? Has your integration technology started to show its age? Come join us for a webinar to hear about recent trends and the future of managed services in integration. Our industry experts will also cover how a new and disruptive trend is changing the face of how we think about integration. Most life sciences companies are challenged with meeting European Medicines Agency’s Identification of Medicinal Products (IDMP) regulatory requirement in 2016, especially since the standard hasn’t been finalized! While many are taking a wait and see approach, others are getting a jump start in figuring out the 5Ws about the data necessary to comply and beginning to execute a plan for success. This means both domain expertise and technology. how IDMP provides the on-ramp to address broader data management and regulatory compliance strategies. There is very little time for those governed by the mandate to design and implement the enterprise-wide data management processes needed to aggregate, cleanse, validate and ultimately syndicate product data..
Live today at 1,200 practices and used by over 30,000 clinicians, EMR-Link does more than just send and receive orders and results electronically. EMR-Link integrates smoothly into your clinical workflow, enabling clinicians and staff to use the same simple workflow and electronic interface for multiple lab and imaging vendors. In today’s fast-paced marketplace, organizations often struggle to find the best way to manage growing volumes of data. Many companies are finding that their existing solutions are being taxed beyond their intended capabilities. The use of managed services to replace in-house B2B (business-to-business) integration systems and functions is increasingly popular. According to a survey of 300 senior IT managers conducted by Forrester Research, 25% anticipate a greater focus on the use of managed services over the next few years—and for good reasons. Collaboration, supply chains and trading partner networks require complex coordination across a growing number of message formats and transport options. A B2B managed services solution provides the expertise and infrastructure to handle these complexities, without the resource cost of designing and maintaining the solution in house. The data integration landscape has become more complex, causing subject matter experts to spend more time and energy facilitating data integration instead of analyzing the data to create business value. This Webinar examines the issues of complex enterprise data integration, especially as more (and larger) data sets are needed. It will also explore new approaches that can ease the development and sustainability of integration without imposing additional constraints on your enterprise. 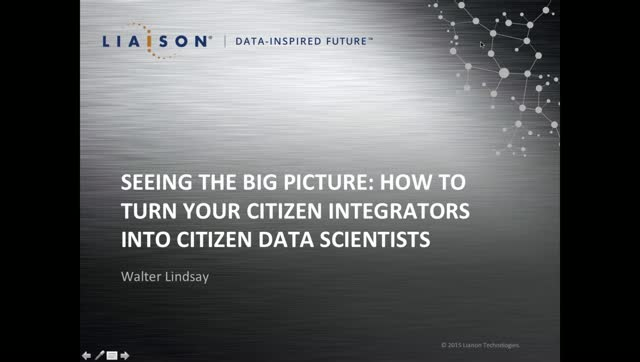 The data integration landscape has become more complex, causing subject matter experts to spend more time and energy to facilitate data integration instead of analyzing the data to create business value. This Webinar examines the issues of complex enterprise data integration, especially as more (and larger) data sets are needed. We'll also explore new approaches that can ease the development and sustainability of integration without imposing additional constraints on your enterprise. Data Platform as a Service (dPaaS) delivers a new, unified approach to integration and data management that is changing the way many companies integrate their operations and glean insights from their data. Join Philip Russom, director of research at TDWI, and Patrick Adamiak, vice president at Liaison Technologies, for an in-depth look at this emerging platform model and the value it can bring to your business. If you didn't make it to the HIMSS15 healthcare IT conference, but want to hear about the hot topics and key takeaways from this year's many informative sessions, mark this webinar on your calendar to get up to speed! This year's event was full of new and innovative technology solutions for the healthcare industry. Last year, e-invoicing accounted for less than 8% of all invoicing activity across the globe. When you consider the many benefits businesses realize after moving to electronic invoicing, one has to wonder why. Liaison Technologies is a global integration and data management company. We provide innovative solutions to integrate, transform, harmonize, manage and secure critical business data on-premise or in the cloud.